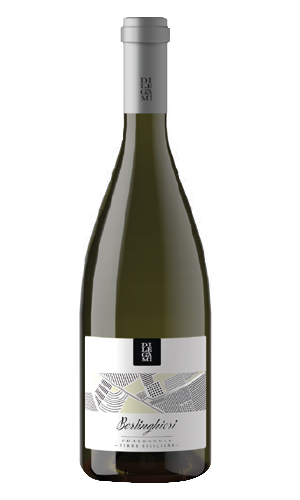 Grapes: 100% organically cultivated Chardonnay. Harvest period: Hand-picked in the first week of august, using bins of 200 kg. Winemaking: Right after a short stay in the refrigerating room, the grapes are de-stemmed at the temperature of 4°C, and macerated for about six hours in a reducing environment and then softly pressed. The fermentation process takes place for the 30% in French oak tonneaux and for the rest in steel tanks at a controlled temperature. After this, an aging period on the fine lees of 6 months will be necessary to let our Chardonnay to obtain unique structural features and organoleptic complexity that will be preserved inside the bottle in time. ORGANOLEPTIC PROFILE: A yellow intense straw-colored white wine with greenish reflections. Fine and elegant on the nose, with hints of tropical fruits, white-pulped fruits and herbs in a harmonic complex characterized by a delicate and elegant vanilla ending. A complex and important white wine, provided with a high acidity and freshness, a good and persistent body with extremely interesting secondary scents among which the aromas good to the nose stand out. Perfect with rich and soft first and second courses, white meat second courses, soft cheese and medium-aged cheese. To be served at the temperature of 12 °C.